Keeping an eye on the ever-evolving world of silicon lithography, GlobalFoundries has recently disclosed additional details about its 7 nm generation of process technologies. As announced last September, the company is going to have multiple generations of 7 nm FinFET fabrication processes, including those using EUV. GlobalFoundries now tells us that its 7LP (7 nm leading performance) technology will extend to three generations and will enable its customers to build chips that are up to 700 mm² in size. Manufacturing of the first chips using their 7LP fabrication process will ramp up in the second half of 2018. First and foremost, GlobalFoundries reiterated their specs of their first-gen 7 nm process, which involves deep ultraviolet (DUV) lithography with argon fluoride (ArF) excimer lasers operating on a 193 nm wavelength. The company’s 7 nm fabrication process is projected to bring over a 40% frequency potential over the 14LPP manufacturing technology that GlobalFoundries uses today, assuming the same transistor count and power. The tech will also reduce the power consumption of ICs by 60% at the same frequency and complexity. For their newest node, the company is focusing on two ways to reduce power consumption of the chips: implementing superior gate control, and reducing voltages. To that end, chips made using GlobalFoundries' 7LP technology will support 0.65 – 1 V, which is lower than ICs produced using the company’s 14LPP fabrication process today. In addition, 7LP semiconductors will feature numerous work-functions for gate control. When it comes to costs and scaling, the gains from 7LP are expected to be a bit atypical from the usual manufacturing process node advancement. On the one hand, the 7 nm DUV will enable over 50% scaling over 14LPP, which is not something surprising given the fact that the latter uses 20 nm BEOL interconnections. 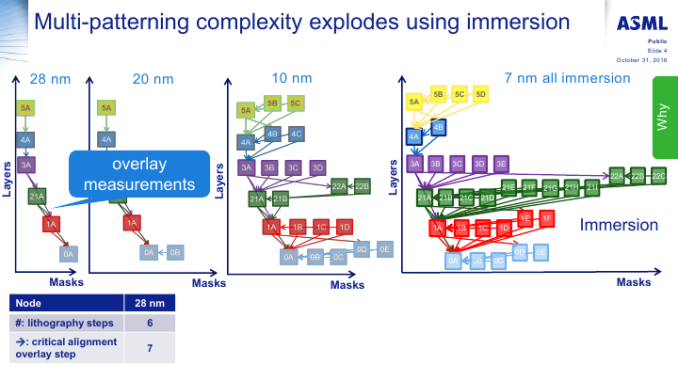 However, since 7 nm DUV involves more layers that require triple and quadruple patterning, according to the foundry the actual die cost reduction will be in the range between 30% and 45% depending on application. 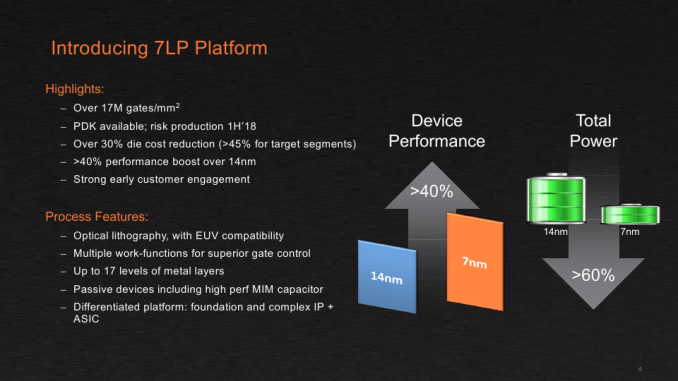 The 7 nm platform of GlobalFoundries is called 7LP for a reason — the company is targeting primarily high-performance applications, not just SoCs for smartphones, which contrasts to TSMC’s approach to 7 nm. GlobalFoundries intends to produce a variety of chips using the tech, including CPUs for high-performance computing, GPUs, mobile SoCs, chips for aerospace and defense, as well as automotive applications. That said, in addition to improved transistor density (up to 17 million gates per mm2 for mainstream designs) and frequency potential, GlobalFoundries also expects to increase the maximum die size of 7LP chips to approximately 700 mm², up from the roughly 650 mm² limit for ICs the company is producing today. In fact, when it comes to the maximum die sizes of chips, there are certain tools-related limitations. GlobalFoundries has been processing test wafers using 7 nm process technology for clients for several quarters now. The company’s customers are already working on chips that will be made using 7 nm DUV process technology, and the company intends to start risk production of such ICs early in 2018. 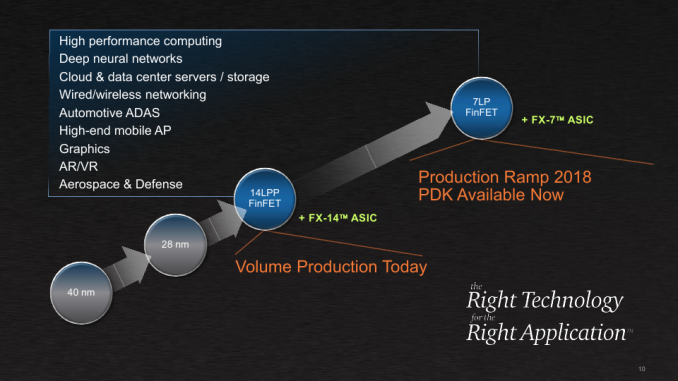 Right now, the clients are using the 0.5 version of GlobalFoundries' 7 nm process design kit (PDK), and later this year the foundry will release PDK v. 0.9, which will be nearly final version of the kit. Keep in mind that large customers of GlobalFoundries (such as AMD) do not need the final version of the PDK to start development of their CPUs or GPUs for a given node, hence, when GF talks about plans to commercialize its 7LP manufacturing process, it means primarily early adopters — large fabless suppliers of semiconductors. In addition to its PDKs, GlobalFoundries has a wide portfolio of licenses for ARM CPU IP, high-speed SerDes (including 112G), and 2.5D/3D packaging options for its 7LP platform. When it comes to large customers, GlobalFoundries is ready for commercial production of chips using its 7 nm DUV fabrication process in 2018. 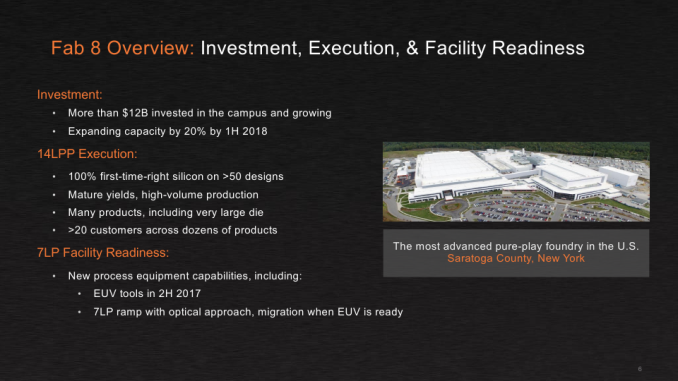 Speaking of high volume manufacturing using their 7LP DUV process, it is necessary to note that earlier this year GlobalFoundries announced plans to increase the production capacity of their Fab 8. Right now, the output of Fab 8 is around 60,000 wafer starts per month (WSPM), and the company expects to increase it by 20% for 14LPP process technology after the enhancements are complete. The expansion does not involve physical enhancement of the building, which may indicate that the company intends to install more advanced scanners with increased output capabilities. GlobalFoundries naturally does not disclose details about the equipment it uses, but newer scanners with higher output and better overlay and focus performance will also play their role in HVM using 7 nm DUV that relies on quadruple patterning for select layers. In addition to more advanced ASML TWINSCAN NXT DUV equipment, GlobalFoundries plans to install two TWNSCAN NXE EUV scanners into the Fab 8 in the second half of this year. This is actually a big deal because current-generation fabs were not built with EUV tools in mind. Meanwhile, EUV equipment takes up more space than DUV equipment because of the light source and other aspects. Usage of multi patterning for ultra-thin process technologies is one of the reason why the industry needs lithography that uses extreme ultraviolet wavelength of 13.5 nm. As avid readers know, the industry has been struggling to develop EUV tools suitable for HVM, and while significant progress has been made recently, EUV is still not quite up to scale. This is exactly why GlobalFoundries is taking a cautious approach to EUV that involves multiple generations. Keep in mind that GlobalFoundries does not seem to have official names for different iterations of its 7 nm process technologies. The only thing that the company is talking about now is its “7LP platform with EUV compatibility.” Therefore, all our generations-related musings here are just for a better understanding of what to expect. ASML has developed several generations of EUV scanners and has demonstrated light sources with 205 W of power. The latest TWINSCAN NXE scanners with recent upgrades have demonstrated an availability that exceeds 60%, which is good enough to start their deployment, according to GlobalFoundries. Eventually, availability is expected to increase to 90%, in line with DUV tools. Meanwhile, there are still concerns about protective pellicles (films) for EUV photomasks, mask defects, as well as EUV resists. On the one hand, current pellicles can handle productivity rates of up to 85 wafers per hour (WpH), which is well below 125 WpH planned for this year. Basically, this means that existing pellicles cannot handle powerful light sources required for HVM. Any defect on a pellicle can affect wafers and dramatically lower yields. Intel demonstrated pelliclized photomasks that could sustain over 200 wafer exposures, but we do not know when such pellicles are expected to enter mass production. On the other hand, powerful light sources are required for satisfactory line-edge roughness (LER) and local critical dimensions (CD) uniformity primarily because of imperfections of resists. Given all the EUV-related concerns, GlobalFoundries will start to insert EUV for select layers in a bid to reduce the usage of multi patterning (and eliminate quadruple patterning in general, if possible), thereby improving yields. 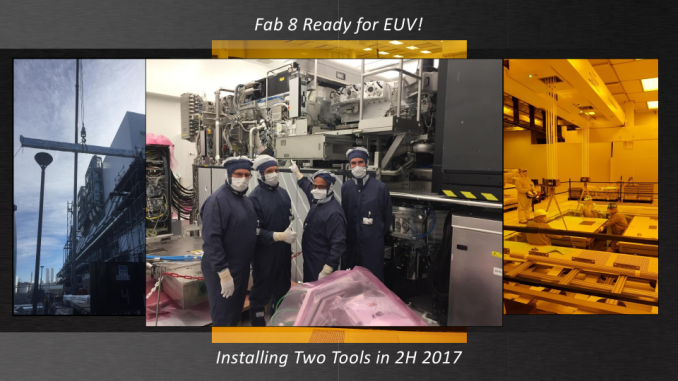 At this time the company is not disclosing when it plans to start using EUV tools for manufacturing, only stating that they'll do so “when it is ready.” It is unlikely that EUV will be ready in 2018, so it is logical to expect the company to use EUV tools no sooner than 2019. 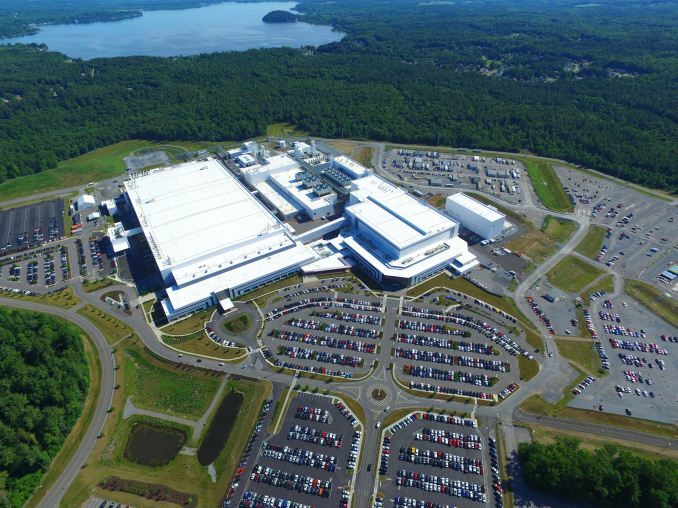 Such approach makes a lot of sense because it enables GlobalFoundries to increase yields for its customers and to learn more about what it will take to get EUV ready for HVM. In the best-case scenario, GlobalFoundries will be able to produce designs developed for 7 nm DUV with multi patterning using its 7 nm EUV tech. However, one should keep in mind two factors. First, semiconductor developers release new products every year. Second, GlobalFoundries will begin to insert EUV tools into production at least a couple of quarters after the launch of the first 7 nm DUV chips. Therefore, it is highly likely that the first EUV-based chips produced at GlobalFoundries will be new designs rather than chips originally fabbed on the all-DUV process. Depending how fast the industry addresses the current EUV challenges related to masks, pellicles, CD uniformity, LER and other things, GlobalFoundries will eventually roll out another generation of its 7 nm EUV process. The second-gen 7 nm EUV manufacturing technology from GlobalFoundries will feature improved LER and a better resolution, which the company hopes will enable higher transistor densities with lower power and/or higher performance. Though given the experimental nature of the tech behind this process, as you'd expect GlobalFoundries is not saying when certain problems are to be resolved and when it can offer appropriate services to its customers. Finally, 3rd Gen 7LP will likely introduce some new design rules to enable geometry scaling and/or higher frequencies/lower power, but in general I'm expecting that the transition to this process should be relatively seamless to IC designers. After all, the majority of layers will still use DUV. 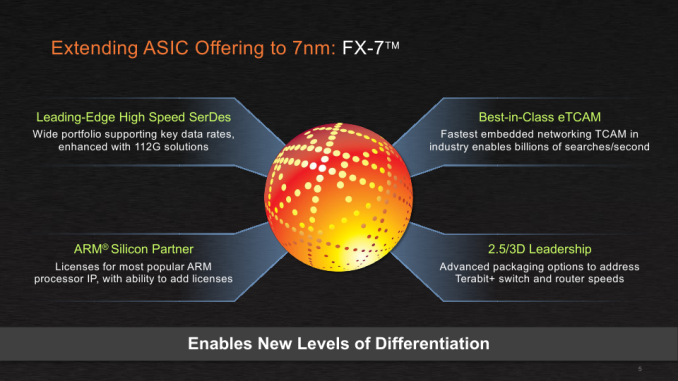 The only question is whether GlobalFoundries will need to install additional TWINSCAN NXE scanners into the Fab 8 for its 2nd Gen 7 nm EUV process technologies, which would also indicate that the number of layers processed using EUV had increased. 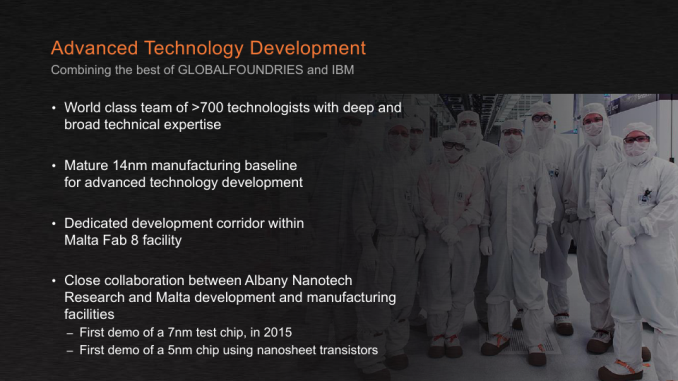 A week before GlobalFoundries disclosed their 7LP platform plans, IBM and their Research Alliance partners (GlobalFoundries and Samsung) demonstrated a wafer processed using a 5 nm manufacturing process. ICs on the wafer were built using silicon nanosheet transistors (aka gate-all-around FETs [GAA FETs]) and it looks like they will be building blocks for semiconductors in the future. The big question of course is when. GAA FETs developed by IBM, GlobalFoundries, and Samsung stack silicon nanosheets in such a way that every transistor now has four gates. The key thing about GAA FETs is that the width of nanosheets can be adjusted within a single manufacturing process or even within the IC design to fine-tune performance or power consumption. When it comes to performance/power/area(PPA)-related improvements, IBM claims that when compared to a 10 nm manufacturing process, the 5 nm technology offers 40% performance improvement at the same power and complexity, or 75% power savings at the same frequency and complexity. However keep in mind that while IBM participates in the Alliance, announcements by IBM do not reflect the actual process technologies developed by GlobalFoundries or Samsung. IBM, GlobalFoundries, and Samsung claim that adjustments to GAA FETs were made using EUV, which is logical as the three companies use an ASML TWINSCAN NXE scanner at the SUNY Polytechnic Institute's NanoTech Complex (in Albany, NY) for their R&D work. Technically, it is possible to produce GAA FETs using DUV equipment (assuming that it is possible to get the right CD, LER, cycle times, etc. 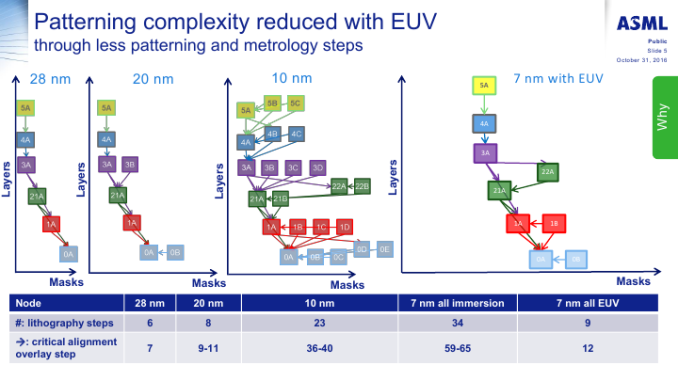 ), but it remains to be seen how significantly the 5 nm process and designs will rely on EUV tools. Neither of the three members of the Research Alliance talked about timeframe of 5 nm HVM, but a wild guess would put 5 nm EUV in 2021 (if not later). 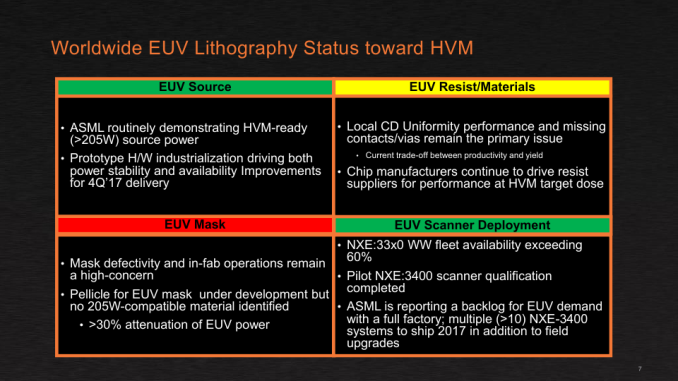 Just like GlobalFoundries said before (like other foundries), the insertion of EUV equipment into their manufacturing flow would be gradual. The company plans to install two scanners this year to use them for mass production several quarters down the road, but GlobalFoundries has not made any further announcements beyond that. Ultimately while the future for EUV is looking brighter, the technology is still not ready for prime time, and for the moment no one knows quite when it'll finally meet all of the necessary metrics for volume production. Finally, speaking of the 7LP platform in general, it is interesting that GlobalFoundries will be primarily targeting high-performance applications with the new technology, and not mobile SoCs like some other contract fabs. This despite the fact that the 7LP platform supports ultra-low voltages (0.65 V) and should be able to address mobile applications. So from a performance/power/area point of view, while the 7LP manufacturing process looks rather competitive, it remains to be seen just how GlobalFoundries’ partners will use the capabilities of the new process. GlobalFoundries Updates Roadmap: 7 nm in 2H 2018, EUV Sooner Than Later?